The Services Configuration Tool is a graphical application developed by Red Hat to configure which SysV services in the /etc/rc.d/init.d directory are started at boot time (for runlevels 3, 4, and 5) and which xinetd services are enabled. It also allows you to start, stop, and restart SysV services as well as reload xinetd. To start the Services Configuration Tool from the desktop, go to the Applications (the main menu on the panel) => System Settings => Server Settings => Services or type the command system-config-services at a shell prompt (for example, in an XTerm or a GNOME terminal). The Services Configuration Tool displays the current runlevel as well as the runlevel you are currently editing. To edit a different runlevel, select Edit Runlevel from the pulldown menu and select runlevel 3, 4, or 5. Refer to Section 15.1, “Runlevels” for a description of runlevels. The Services Configuration Tool lists the services from the /etc/rc.d/init.d directory as well as the services controlled by xinetd. Click on the name of the service from the list on the left-hand side of the application to display a brief description of that service as well as the status of the service. If the service is not an xinetd service, the status window shows whether the service is currently running. If the service is controlled by xinetd, the status window displays the phrase xinetd service. To start, stop, or restart a service immediately, select the service from the list and click the appropriate button on the toolbar (or choose the action from the Actions pulldown menu). 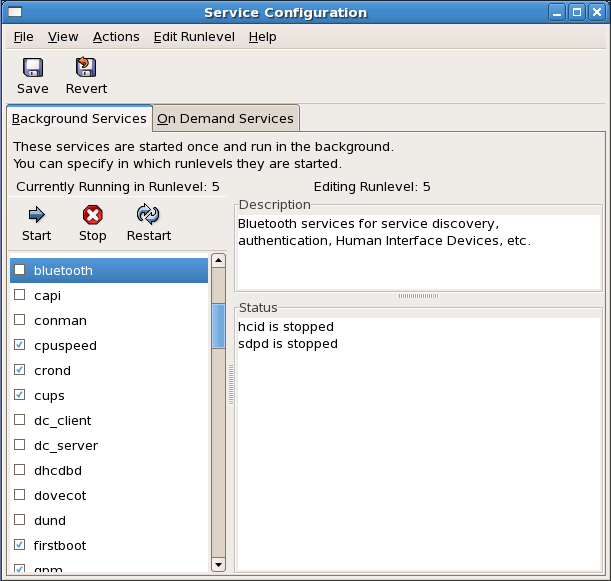 If the service is an xinetd service, the action buttons are disabled because they cannot be started or stopped individually. If you enable/disable an xinetd service by checking or unchecking the checkbox next to the service name, you must select File => Save Changes from the pulldown menu (or the Save button above the tabs) to reload xinetd and immediately enable/disable the xinetd service that you changed. xinetd is also configured to remember the setting. You can enable/disable multiple xinetd services at a time and save the changes when you are finished. For example, assume you check rsync to enable it in runlevel 3 and then save the changes. The rsync service is immediately enabled. The next time xinetd is started, rsync is still enabled. When you save changes to xinetd services, xinetd is reloaded, and the changes take place immediately. When you save changes to other services, the runlevel is reconfigured, but the changes do not take effect immediately. To enable a non-xinetd service to start at boot time for the currently selected runlevel, check the box beside the name of the service in the list. After configuring the runlevel, apply the changes by selecting File => Save Changes from the pulldown menu. The runlevel configuration is changed, but the runlevel is not restarted; thus, the changes do not take place immediately. Stop the httpd service — Stop the service by selecting it from the list and clicking the Stop button. A message appears stating that the service was stopped successfully. Reinitialize the runlevel — Reinitialize the runlevel by going to a shell prompt and typing the command telinit x (where x is the runlevel number; in this example, 3.). This option is recommended if you change the Start at Boot value of multiple services and want to activate the changes immediately. Do nothing else — You do not have to stop the httpd service. You can wait until the system is rebooted for the service to stop. The next time the system is booted, the runlevel is initialized without the httpd service running. To add a service to a runlevel, select the runlevel from the Edit Runlevel pulldown menu, and then select Actions => Add Service. To delete a service from a runlevel, select the runlevel from the Edit Runlevel pulldown menu, select the service to be deleted from the list on the left, and select Actions => Delete Service.